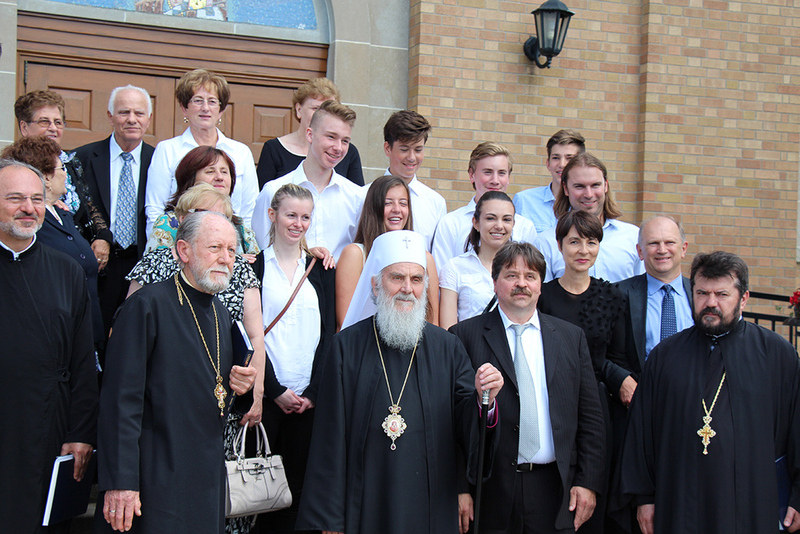 Hamilton, Ontario - The Serbian Patriarch, His Holiness Irinej, administrator of the Diocese of Canada visited on Sunday, June 21 the St. Nicholas Cathedral in Hamilton. There are two church-school congregations in this city and three parishes. This church, on Nash Street and dedicated to St. Nicholas is proclaimed a cathedral church. Bishop Georgije was enthroned in this church as bishop of Canada on the Protection of the Most Holy Theotokos in 1984. 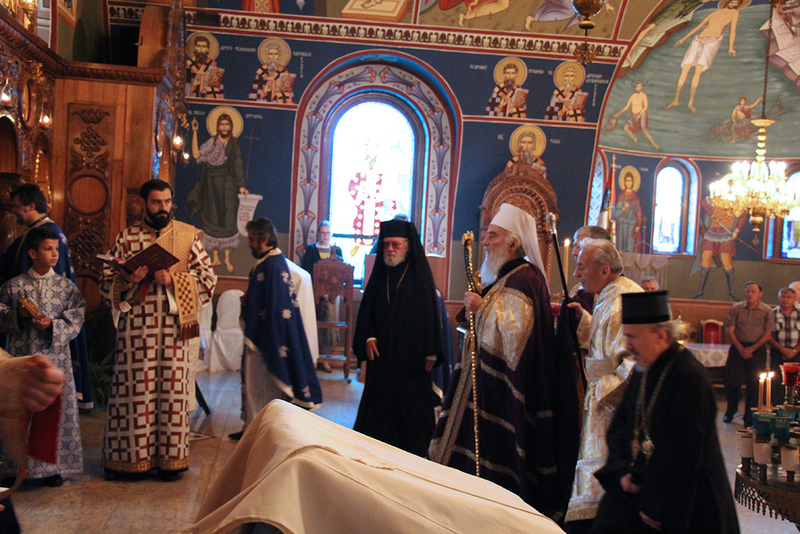 Concelebrating with His Holiness was: His Grace Bishop Christopher, vicar to His Eminence Metropolitan Sotirios (Greek Orthodox Church); His Grace Bishop Mitrophan of Eastern America, V. Rev. 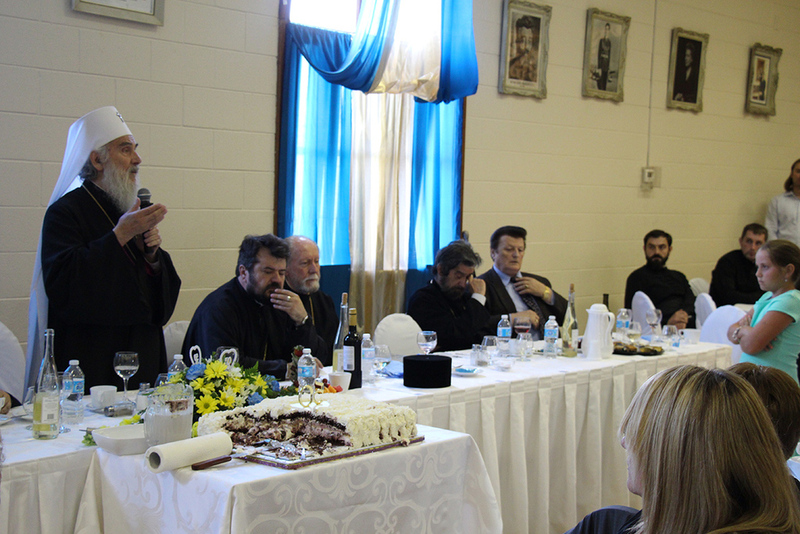 Stavrophor Vasilje Tomic, Episcopal Deputy and parish priest of the north Toronto parish, V. Rev. Stavrophor Stevo Stojsavljevic, long time parish priest of this church (1976-2005), V. Rev. 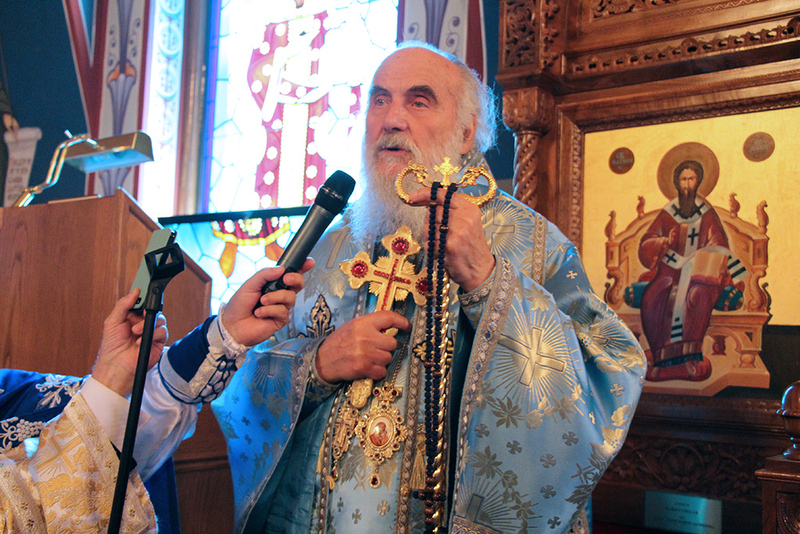 Stavrophor Lazar Vukojev, long time parish priest of this churc (1988-2012); V. Rev. Stavrophor V. Rev. Milojko Dimitric, cathedral dean, V. Rev. Stavrophor Vojislav Pavlovic, dean of the other Hamilton church, V. Rev. Djuro Samac, parish priest and Protodeacon Damjan Bozic and Deacon Djuradj Kojic. This church school congregation was founded in 1913 and the first church was built in 1917. The new church on Nash Road was built in 1965. 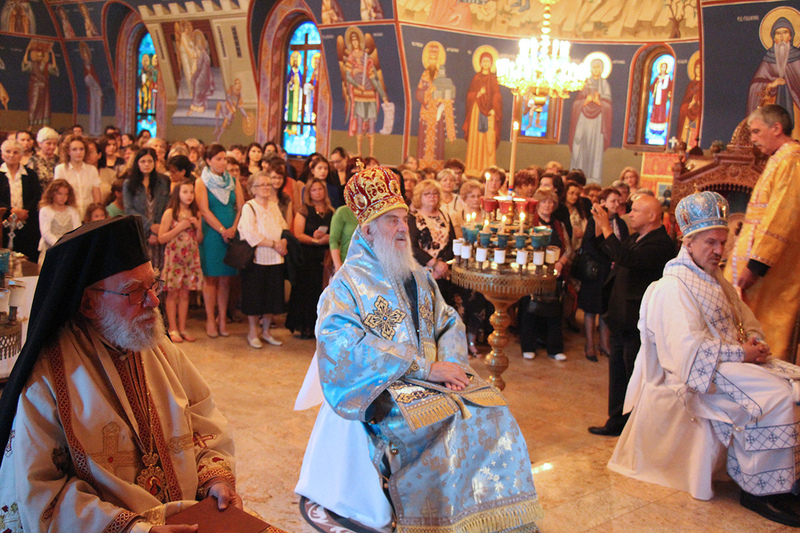 The foundation of the church was consecrated by Bishop Stefan (Lastavica) as well as the church. The beautiful parish home was blessed by Bishop Georgije in 1988. After communion, of which many partook, the parish priest V. Rev. 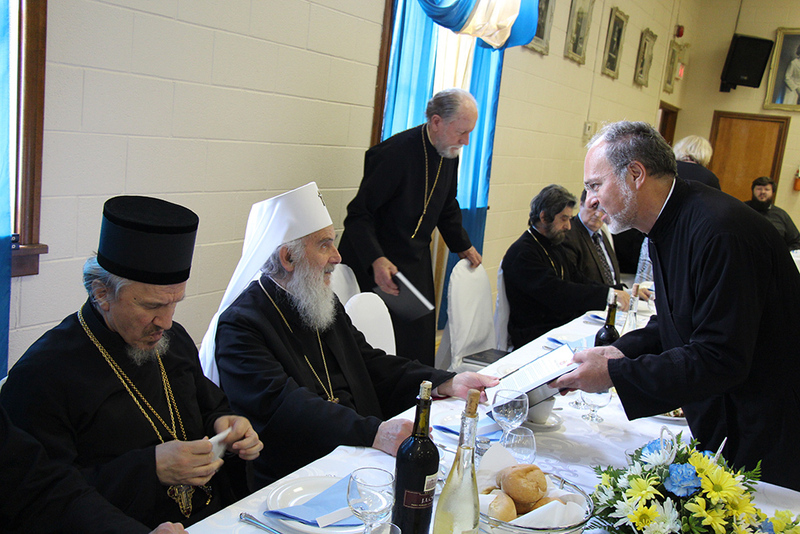 Stavrophor Milojko Dimitric welcomed His Holiness Serbian Patriarch Irinej and administrator of the Diocese of Canada saying: "We are all joyful today for we can welcome you as the first hierarch of our Church and our Diocesan bishop....Welcome Your Holiness to this Cathedral church which today marks and celebrates its fiftieth anniversary. On June 17, 1965 this church was consecrated and from then to this day, for half a century, this holy church has been gathering the faithful people of Hamilton. 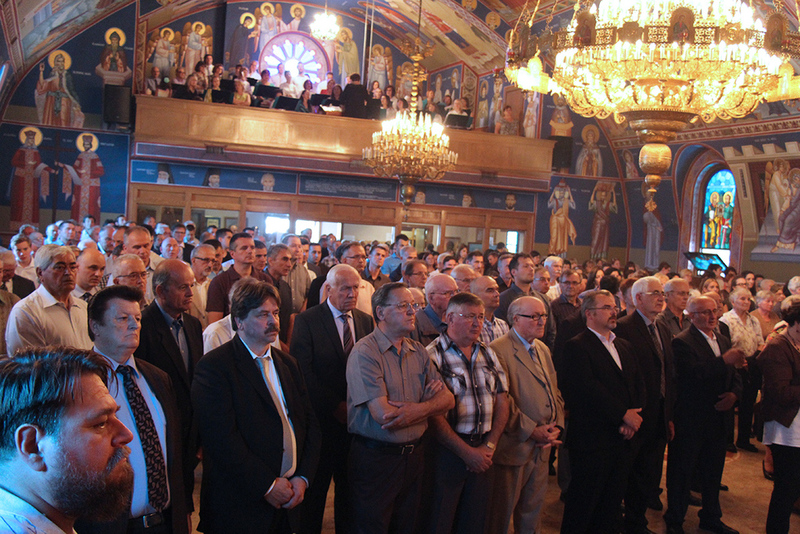 We can freely say that already the third generation of Serbs find their spiritual nourishment here. 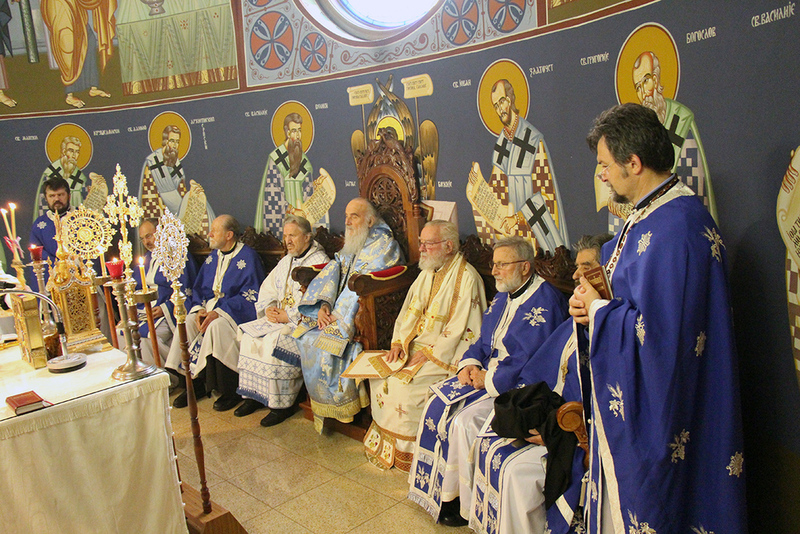 Our faithful and members have given the greatest contribution to the founding of the Diocese of Canada and the Holy Transfiguation Monastery in Milton, today's diocesan see. With your coming you have gathered us, not only our faithful and members, but the faithful from our sister church St. Nicholas on Barton Street who are with us today together with their priest at this liturgical gathering. All of us gathered here await Your Holiness' blessing for peace and love in the community with our Church, which, be assured, the people here nurture in their souls. 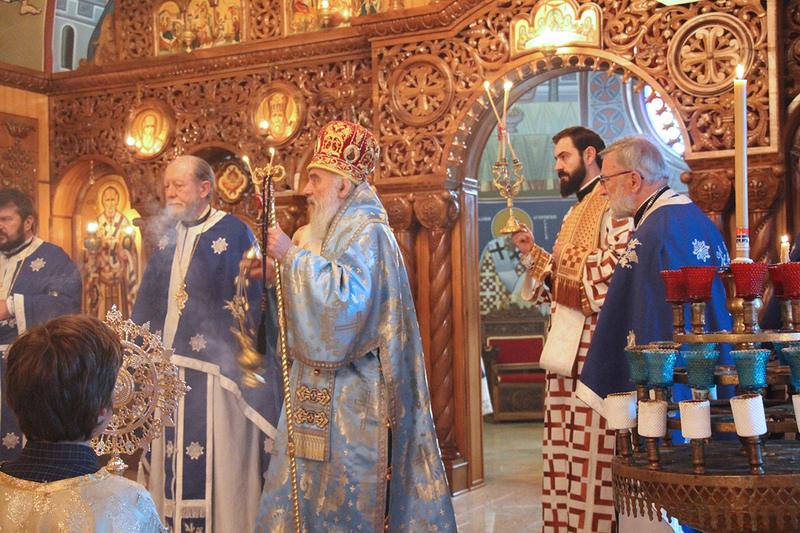 This is your first visit to our community as Serbian Patriarch, therefore we ask that you bless us and teach us that we might remain true to the path on which St. Sava taught us and on whose throne Your Holiness leads our church." Surrounded by clergy and a multitude of faithful, His Holiness addressed every present from the Bishop's throne indicating God's concern and the concern of the Church for her people. 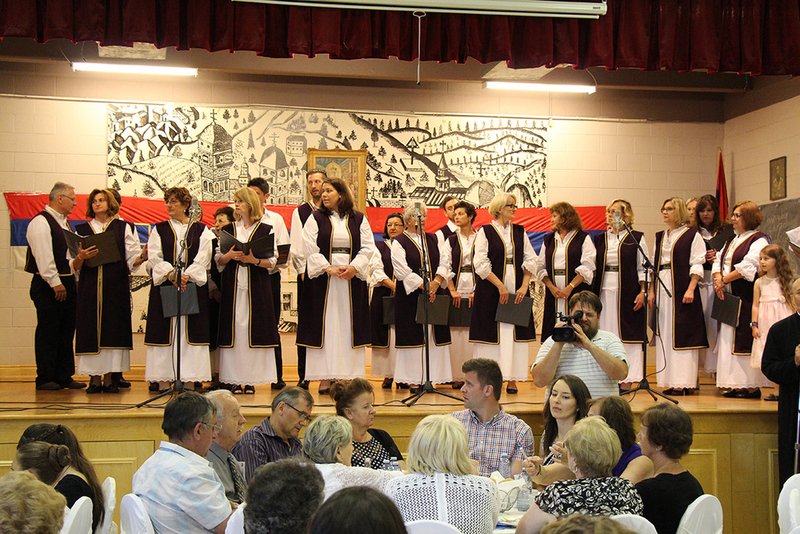 The choir has been a part of the St. Nicholas Church since 1964 taking part regularly in the services, helping with various church activities and their Serbian community. The folklore group "Avala" has been a part of this parish since 1975 and today has five different age groups. The Serbian school has children from pre-school to 8th grade while the older children are active in assisting the teachers. 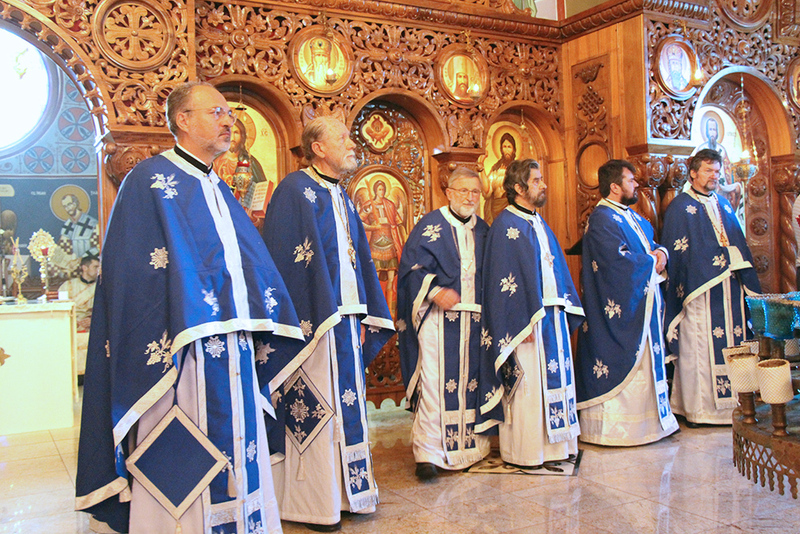 The Circle of Serbian Sisters is the main driving force of this community. Their hard working members from the very founding of this parish are active in the life of their church. This church-school congregation publishes a church bulletin "Glasnik" which includes information of activities of all organizations that are active in this church. 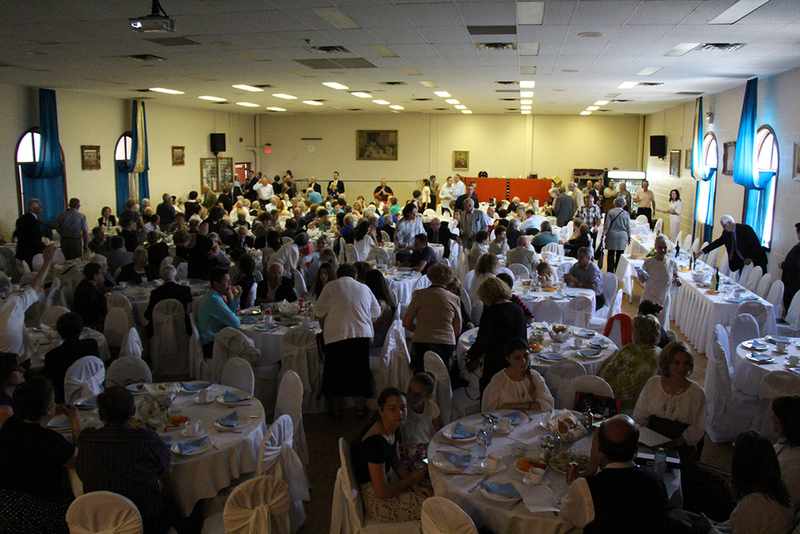 At the banquet hall a formal luncheon was prepared in honor of the Serbian Patriarch on the occasion of the 50th anniversary of this church-school congregation. The program was led by V. Rev. Djuro Samac, parish priest. Fr. Samac, in his introductory remarks, reminded everyone of the beginnings of this Serbian community. The founding of the parish, purchase of the property, buildling the hall, church, forming the various organizations, frescoes... The choir sang a few selections and the folklore group performed. 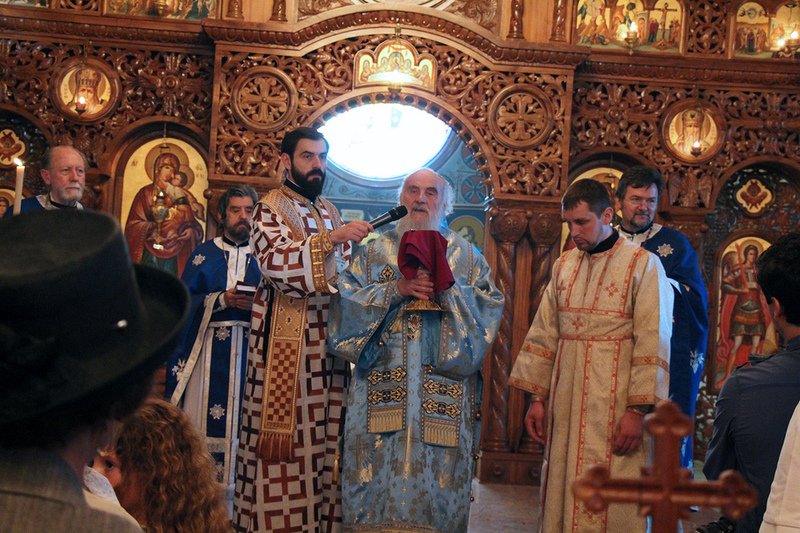 At the very end Patriarch Irinej addressed the congregation.